That said, moving in together is also one of the most notable tests of a relationship, too. It might be cliche to say, but it’s generally agreed that you never really know someone until you live with them on a day-to-day basis. Although you may experience a honeymoon period once you’ve settled down, the reality remains that there will be complications and bumps in the road. The question remains: are you ready to tackle them? To help you hash things out as a couple, we’ve put together a list of pointers to consider if you’re moving in with your significant other for the first time. There are no two ways about it: living together inevitably breeds disagreements. By accepting it’s going to happen now, you can temper your expectations when arguments do arise. Seriously. Whether it’s who’s responsible for taking out the trash or a missed utility big, the seemingly “small stuff” can quickly spiral into screaming matches for the most level-headed couples. A recent article in BlackLove titled “How to Argue Like a Pro” outlines some “ground rules” for these inevitable arguments that couple should stick to. That is, stick to a single topic and treat your significant other how you’d want to be treated while talking to them. On the flip side, name-calling and digging up past issues are off-limits. 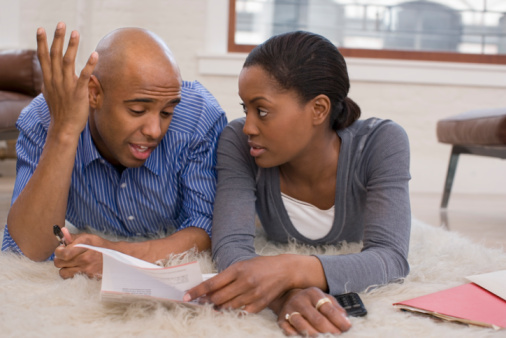 Money is easily one of the biggest sources of stress for couples that move in together. There is no “right” way to allocate finances: some couples prefer to split things 50/50 while others come up with a budget based on their individual incomes. Beyond rent, utilities and groceries, also bear in mind emergency expenses whether they are related to your residence or something medical. Splitting your emergency fund is can help you tackle those nagging expenses without tearing apart anyone’s budget. And this is a no-brainer, but living together also means being responsible in terms of holding down employment and paying your bills on time. Although you might be able to bail out your significant other in a financial jam, that shouldn’t be a regular occurrence moving forward. Combining your things as a couple can be tricky but is crucial for avoiding excessive clutter. Think about it. Do you really need two television sets? Dozens of the same type of dishes? The list goes on and on. On that last note, nobody should be expected to throw out all of their stuff. Make sure to share the responsibility of pitching personal items so it doesn’t feel like a one-sided affair. Despite popular belief, personal space is healthy for your relationship and therefore spending some time apart is a good thing when you’re living together. After all, everyone deserves room to pursue hobbies and spend their time how they want to. If your partner wants to do something by themselves, let them! The same logic applies to yourself if you need some quiet time. These expectations need to be communicated to guarantee nobody feels slighted or claustrophobic. On that note, also make a point to still schedule regular date nights to prevent yourself from feeling too cooped up together. How you divide chores is as important as getting the chores done themselves. For example, don’t arbitrarily decide that one of you should be responsible for all the cooking or dishes. You should stress the sort of chores that you don’t mind doing and likewise compromise on the ones that you both find to be a pain. In short, tending to your new residence shouldn’t be a one-sided task. Moving in together is a huge milestone in any relationship, but it’s definitely not one to take lightly. To ensure that you make the most of your time together and ensure the process goes as smoothly as possible, keep these pointers in the back of your mind.